This guide is created with pure mind and heavy research,I personally made a list of top five best gas grills under $200 in 2018 pocket-friendly and highly featured. The products have received their ratings ranging from 1 – 5 through my independent research. This Ultimate guide can be gold for Christmas 2018! imagine yourself grilling some crispy meat in your backyard ! 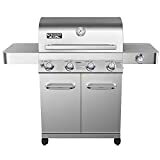 Yes, it is listed on First position because it is the most worth grill under 200$ mark it is blessed with 12,000 BTU Side Burner and construction is solid and strong also featured with Porcelain coated cast-iron grill grates(currently best in industry) the cooking area is 630 Sq. Trust me it is sufficient for perfect grill day and the handle is provided with wooden hoods that keeps them cool so no issue of safety also the Char-Griller 3001 Grillin is attached with electronic ignition that is also very essential now days, side self makes it so comfortable convenient prep workspace. The Side burner is like extra space for extra food! you can fry anything or make sauces, fry bacon while preparing the steaks on the grill, trust me it is very much helpful and worth it, also the bottom part is attached to two small wheels which can be easily make your grill move without extra efforts and two gripe legs make it stable while grilling! In-few words it is most Worth and FLAGSHIP the best gas grills under $200,i personally have this giant and grill almost everyday and i can bet you gonna thank grillinsight.com after having it. Some Personal Observation This is like rapid machine, it gets hot and fast and like when I switch all three burners to low it stays 400 degree and when turn them to less than medium it jumps to 500 or more,the top warming self is the biggest help in this grill machine and my son dont like that “black stuff” on their hotdog so i mainly cook on warming space without burning it also the charcoal grill can deposit ash or particles but this gas grill is simply amazing. Char-Griller 3001 Grillin has a steel structure and is built nicely with heavy metallic shelves on the sides for better operation. The instructions manual may not come handy but if the pictures or diagrams are followed thoroughly, they can help you to reassemble the product with ease. The product had a missing bracket, which secures the propane hose but it may not require one if you are careful with it while handling. While you turn on the propane, it is a difficult process due to the valve’s location as it located under the grill. The wheels of the grill are the weakest section but should not be a problem if handled carefully when the grill is being moved. Also, take great caution and do not try to lift the grill by holding either of the side trays. It is haphazard but I take great care by holding on to the grill body while rolling the entire structure around. When it comes to heating, I can assure you that it heats up evenly and is also very fast. The best thing is to preheat the grill and then, monitor the temperature while you are cooking to get the best out of the grill. The chimney structure is such that no heat is lost and the heat is evenly distributed around the grill. The compact and wonderfully composed Barbecue grill perfectly book 6 burgers at a time.Alternatively, you can Rose a whole chicken breast and serve it which sausages the way you want. The solidified built of the product takes around 6 – 8 minutes to reach 500 degree mark. The best feature of the grill is the greeting design it carries. The food does not drip upon the gas burner at all. Moreover, the beautiful spring shade of the product is an add on to your kitchen appearance. You would love to carry the Barbecue grill while going out for camping with your friends. If you want a little grill, this is the one! No Doubt about it, at all. Living in an apartment complex and having the passion of grilling and barbeques is a myth but this grill has helped me live my passion. I have used it more than twice a week at my apartment as well as on the beach during outings. It is small and concise, and looks tiny but can fit up to six chicken breasts or burgers simultaneously. The trays come in handy for cooking as I can all the utensils that I need while cooking. The trays are rock solid and I do not fear the tray tipping over if the contents on the tray become heavy. The grill gets hot very fast, that too within 8 minutes and can hit the 500-degree mark when it is turned on the highest setting. My most favourite feature is the design of the grates. The placement is so nice that even if the food drips, they do not drip on the gas burner.This helps to keep the flame even and do not clog the burner with dirt. I clean it with ease using steel brush and using foil makes it easier while cleaning before going on trips. The burners clean perfectly. As the colours are also bright and the food is deliciously cooked, they help me in making new friends on camping and road trips. The grill has never failed me yet and I feel that is the reason why I like this grill. The cons are yet to be discovered about the product and that is what makes it a great buy as I use my grills in a rough manner. 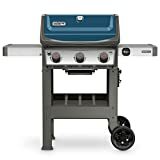 The other grills usually rust in two to three years and I&#39;ll be giving more than 5 stars if the same does not happen with this grill. 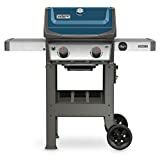 Another Best gas grills under $200 when we search about value for money , this fabulous grill is priced at only $149 with the rating of 4.1, who would leave the wonderful tabletop gas grill that maintains the heat even after it has been switched off. It has 240 square inch cooking grate. The friendly nature of the product conveniently allows you to cook vegetables, chicken breast and steak within just few minutes. It has a Removable drip tray ,12,000-BTU tabletop gas grill with stainless-steel burner which is very powerfull and Twist-start ignition for easy start-ups.No matter what you put within the grill, it comes out well cooked and tasty every time. 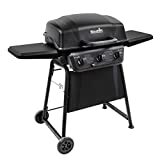 I was waiting eagerly to but a Tabletop Gas Grill, and upon window shopping at Amazon, when I found this Grill being offered as A Deal of the Day, I could not resist myself but purchase it. Along with this, I bought the grill cover, the stand and the hose adaptor for 20 lb. propane cylinder. I was astonished to see this grill, when it was delivered to me. For starters, the primary components do not require assembly. You just have to attach the grill to the legs and, you are free to start grilling. The grill has an impressive structure and the accessories require no rocket science while being assembled. Another great aspect about this grill is its foldable stand. I would recommend you all to exercise great caution and care while setting it up as you may hurt your fingers with all the parts. I can vouch for the water resistance of the covers and it has amazing build quality, as upon delivery, this feature was put to use. The rain did not affect the grill for a week, as when I removed the cover the grill was perfectly dry. Although, the cover exposes the stand, but may not require covering as it is well built. We should talk about the grilling now. It is a delight using this grill, as there is enough space, which allows me to have great barbeques. It has even heat distribution, which does not burn the food and lets me cook more and more. I have a family of four and often enjoy the barbeques on weekends. Whenever I am cooking meat like briskets, steak etc., there are flare-ups but it usually happens due to high fat content in the meat. Not going away while cooking is helpful in situations like these. Another important part of having a grill is to clean it. It was an ease while cleaning the grill as the flame tamer and the grate are removable and can be cleaned anywhere. I clean at the sink, as the size is manageable. I clean the grease cup regularly as it is small due to the grill being portable. Upon removing the grate and the tamer, the bottom of the grill becomes easier for cleaning. I find this grill great and I would love to recommend it to you all, who want a portable grill. In addition, the compactness of this grill appeals to me, as it does not require much space. However, do not let the size fool you even once as the capacity is greater and it is very crucial for me. To be honest, I had given it many thoughts before buying, and all those thoughts were wrong, as it was the best decision ever. Char-Broil again ! seems like they are really good at manufacturing grill machines! 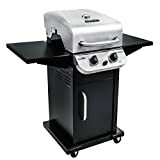 well this particular product is amazon’s editor choice and the price is really affordable just 139$ apart from low price this Gas Grill is provided with 280 square inches of cooking space over porcelain-coated grates ,it can easily grill some burgers for few friends,Assembly is required and it is blessed with side shelves of around 12 x 13 inches made up of metal and really helps as prep space. This Grill is best example of portable gas grill out here, the Stainless Steel construction keeps the grill our of rust forever and gives it the shiny look u an imagine in idol american grill machine The cooking area is 205 sq. provided with 105 sq. Chrome-plated warming rack, it is fold-able and easy to carry like briefcase and best for outdoor picnics and events hassle free and the grill support disposable one-pound propane cylinder. Moreover, it is provided with thermometer on top side to show mealtime temperature inside grilling section ! cleaning is also easy and it cooks really well and heating catches within few minutes. Price is 75$ on amazon it is best buy if you are looking for most handy and portable gas grill which really cooks well. This compilation literally helped me to find a suitable gas grill for myself. Thank you!